The rail signal divides rails into blocks and allows locomotives to react to other locomotives allowing multiple trains use the same rails without colliding. Blocks span all connected rails regardless if a train can actually travel between them. Rail signals can also be used in with conjunction rail chain signals, which also separate rails into blocks. Signals dividing rails into blocks. Each block is highlighted with a different color. Which block a signal monitors depends on which side of a rail it is placed. When a signal is on the right-hand side of the track it monitors the block in front of it. When placing rail signals, the opposite signal positions will be highlighted in white. If a signal doesn't have another signal opposite of it, locomotives will only be allowed to travel in the direction that has a signal on the right-hand side. Green - The monitored block is empty. Yellow - A train is not able to stop before the monitored block and will pass the signal. The debug option show_train_stop_point can be used to see the distance locomotives need to stop. Red - The monitored block is not empty or another signal monitoring it is orange. Blinking - The signal is not on a rail, or the monitored block is also the block before the signal. When a signal is red, locomotives will stop before it. A rail chain signal can be used to make locomotives stop earlier, as they will always mimic the signal of what is in front of them. The interface for configuring a circuit network connection for a rail signal. A circuit network condition can be configured that when true will make the rail signal red. A rail signal can also output three different signals depending on if it is in its green, orange or red state. If a rail signal is red because of a circuit network condition the rail signal won't output a circuit network signal. The rail signal is now connectable to the circuit network. Halved the mining time of the rail signal. 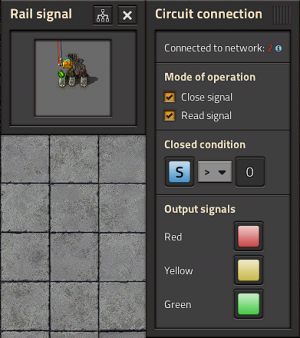 Rail signal stop placement indicator added. 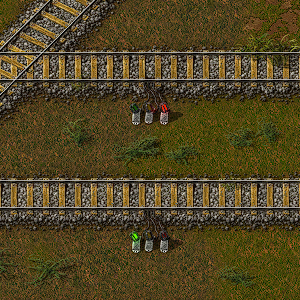 Rail signal that fails to divide two sections of rail will blink multiple colors. Players no longer collide with the rail signal. Players can now see a visualization of the protected rail area when building/selecting the signal. Rail signals connect to more than one rail when connected to a junction. This page was last edited on 5 December 2018, at 10:09.